Whitby Town’s Kieran Weledji believes that he and his teammates will go into Saturday’s FA Cup tie with Penistone Church with confidence after the 1-1 draw with Workington. 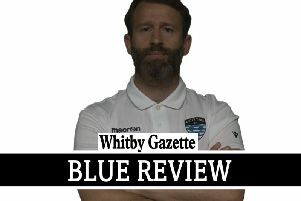 The Blues have endured a tough start to their Evo-Stik Premier campaign, having lost four of their opening six matches. This weekend however, provides a break from league action as Chris Hardy’s side travel to Northern Counties East League Premier Division side Penistone Church. Weledji, who opened the scoring against the Reds, says that the side will take positives going forward, but expects a tough game on Saturday. “The point on Monday gives us a boost,” Weledji told the Whitby Gazette. “It’s a boost that we don’t just take into the cup game, but the league games too. “Saturday gives us a chance to carry that on. “It’ll be tough. The lads are confident though. We’ll go into it looking for a win as you always want a good cup run. Weledji, originally a defender, has had a good start to the campaign after moving up front, scoring twice since the start of the season and is aiming to continue his recent form. “I like the position and running in behind the defence,” Weledji added. A fans’ bus leaves the Turnbull Ground at 9:30am on Saturday. Places cost £10 and can be booked through Graham Manser on 07966 241 344.